Thanks to green farming practices Sprig(wood) Toys has arrived!!! 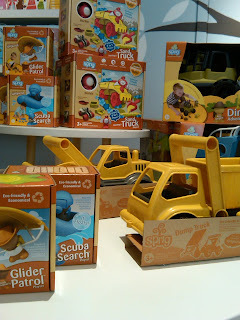 I am personally so excited about this toy company; they encompass everything a parent wants in a toy- great design, socially responsible, eco-friendly, and safe (no bpa, vinyl, pthalates, etc). This toy company was started by three toy designers who were saddened after visiting factories where their toys were made. They saw the impact that the factories left on the environment and surrounding community. They also began to feel that too many toys were not encouraging children to be involved in play and required batteries. They vowed to change this. Sprig Toys is made of recycled margarine containers and wood particles, which gives these toys a great texture and allows them to not use paint also cutting down on off gases. 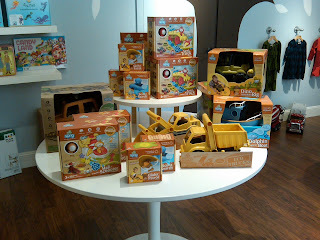 The toys all come in minimal packaging, and would look great in any ones living room, dining room, kitchen, etc. As we speak the dinosaur explorer is zooming through my house with my son, and little friends in tow. Sprig Toys came into my life and now the store through a customers recommendation, and I can't recommend them enough- these toys are amazing. I'm pretty sure that Santa will be delivering Sprig to my house this year - how about yours???!! !